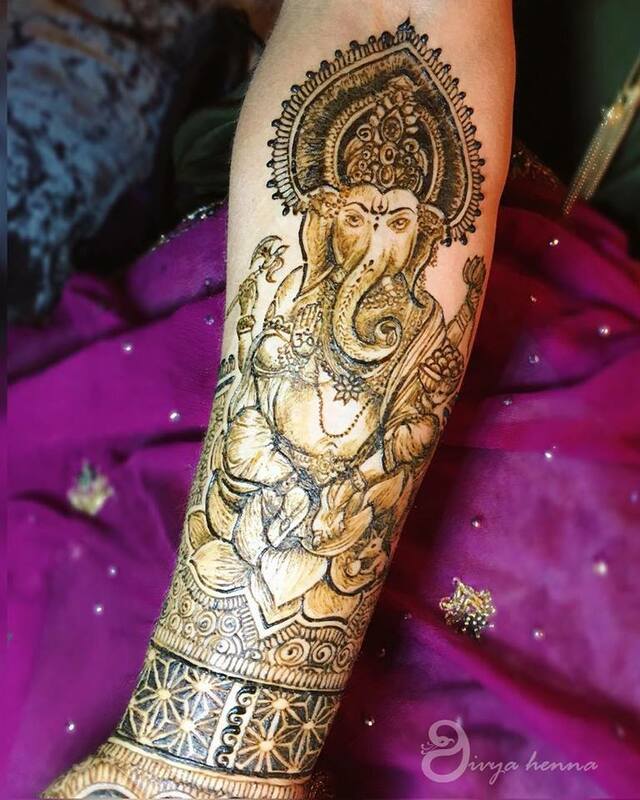 Bridal Mehendi Designs you Just CAN'T Miss this wedding season!!! 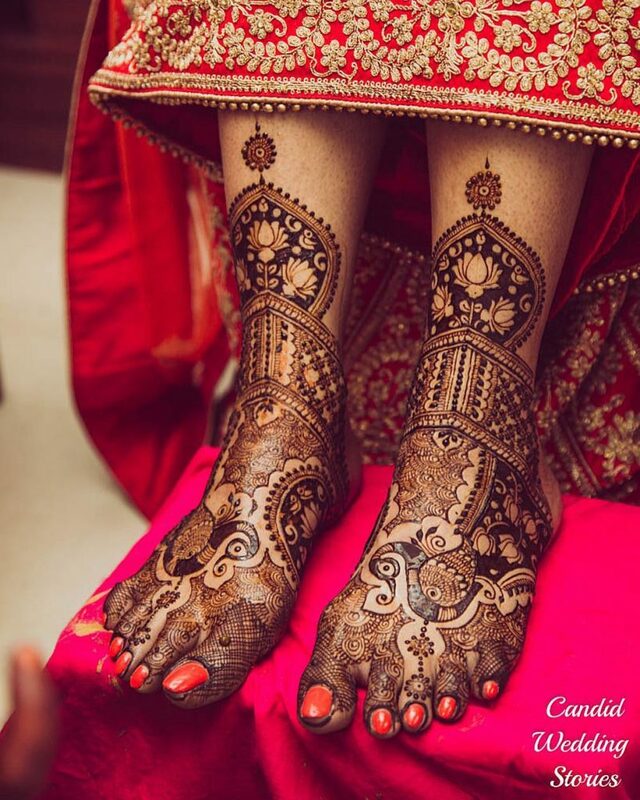 Bridal Mehendi Designs you Just CAN’T Miss!!! 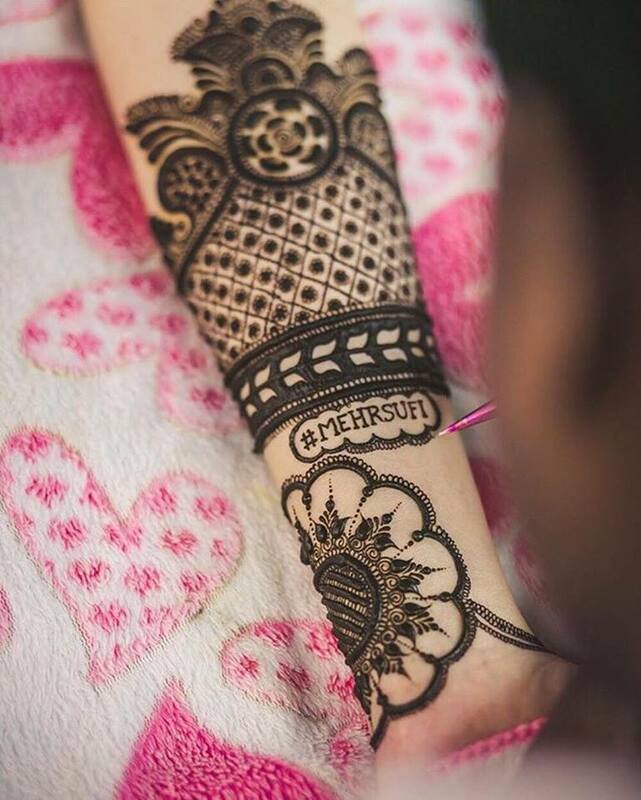 Who doesn’t love mehendi? 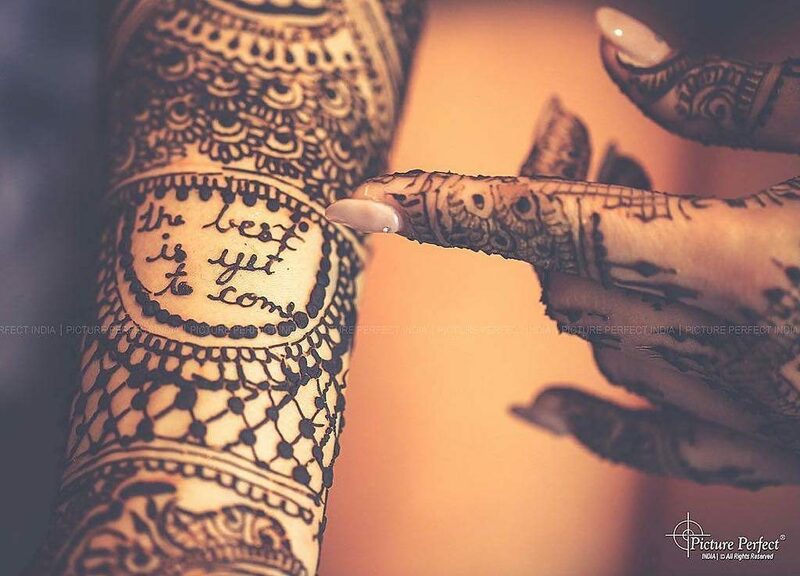 And when it comes to your bridal mehendi, you simply can’t compromise! 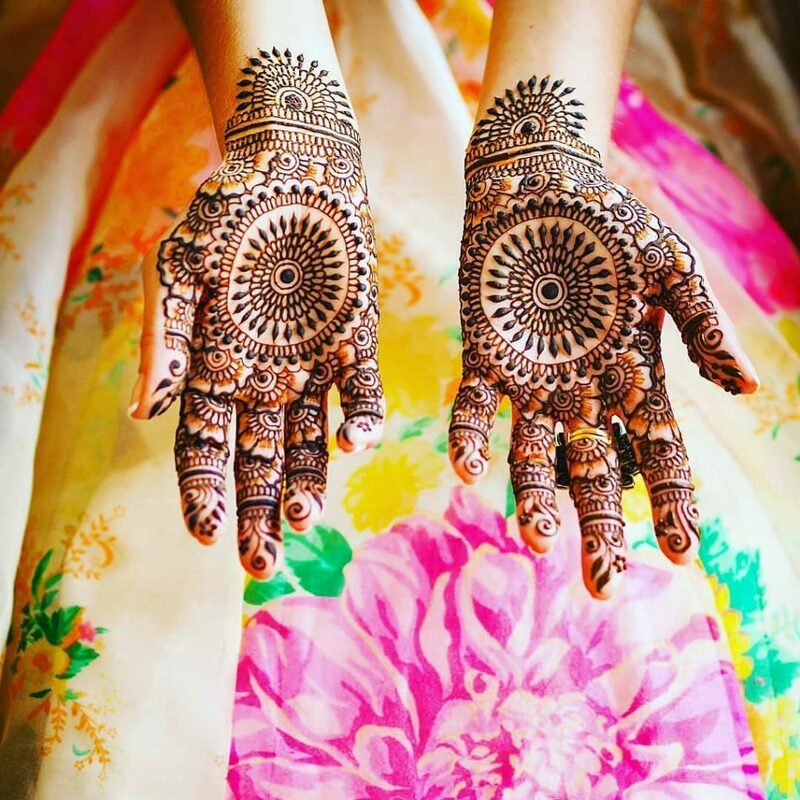 Here’s our choicest pick of the best and most stunning bridal mehendi designs that you just can’t miss! Isn’t love all about cute games, sweet nothings and hidden hints! 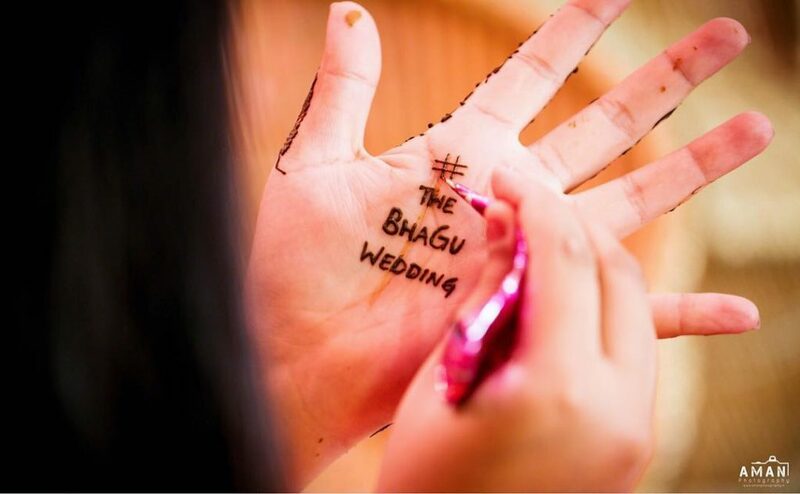 Why not include your own personalized messages as hidden love notes in your mehendi. 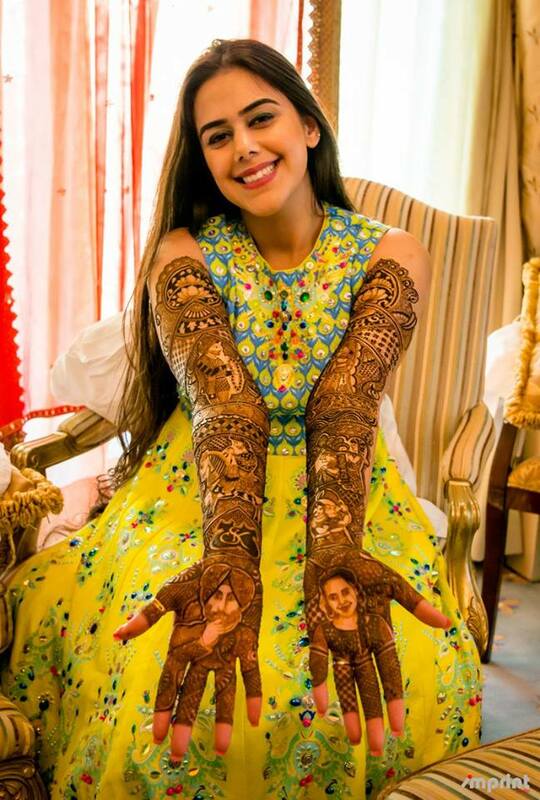 Can you imagine the fun of getting your own cute message inscribed in your mehendi hands and asking him to hunt for it later! 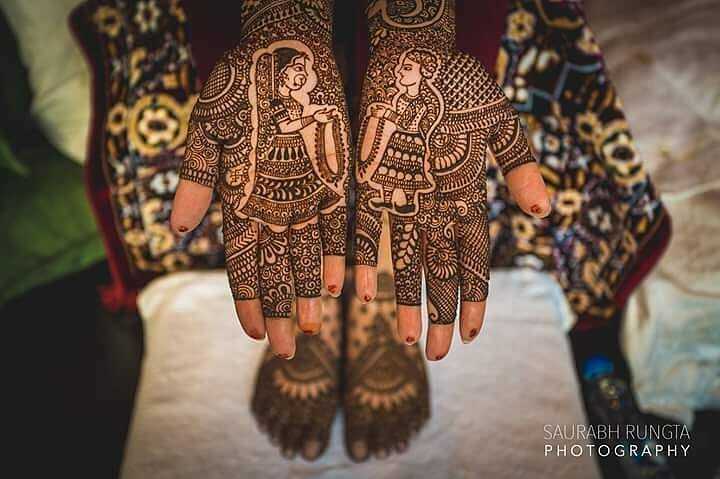 While we all love intricate mehendi designs, there’s nothing as beautiful as the upcoming wedding rituals etched in your bridal Mehendi! 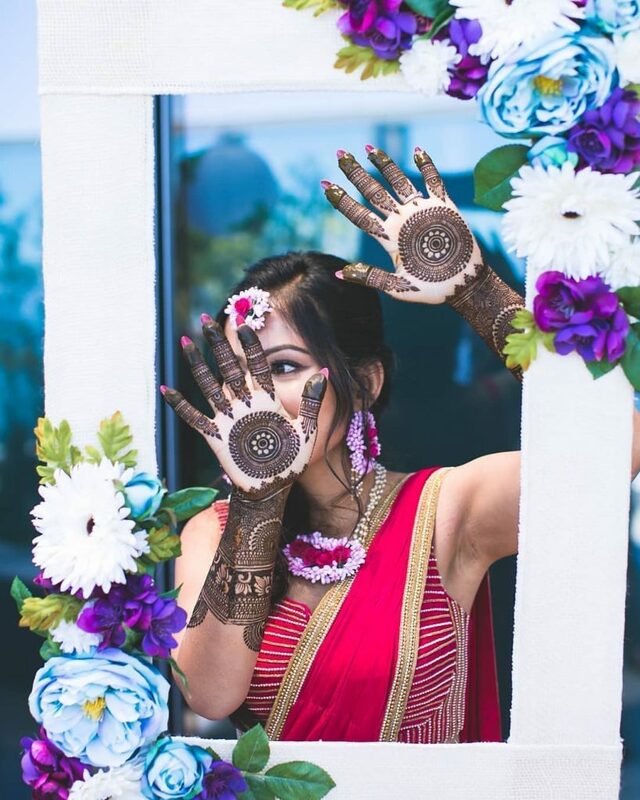 From sindoor to varmala to the first dance – almost any wedding moment can be depicted in your henna hands, all it needs is a li’l imagination, creativity and lots of talent on part of the mehendi artist! 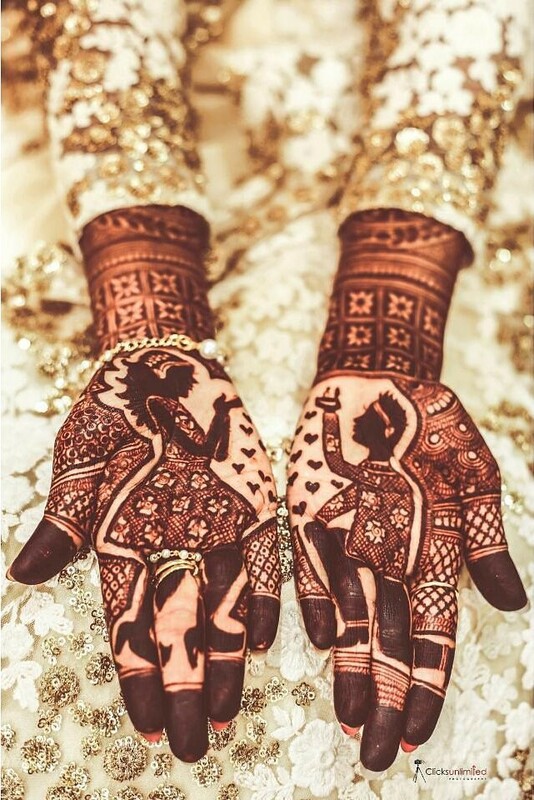 Aren’t we in louuuve with these beautiful pieces of henna art! Note how the beautiful sindoor scene is complimented by dancers in Warli art style on this one! 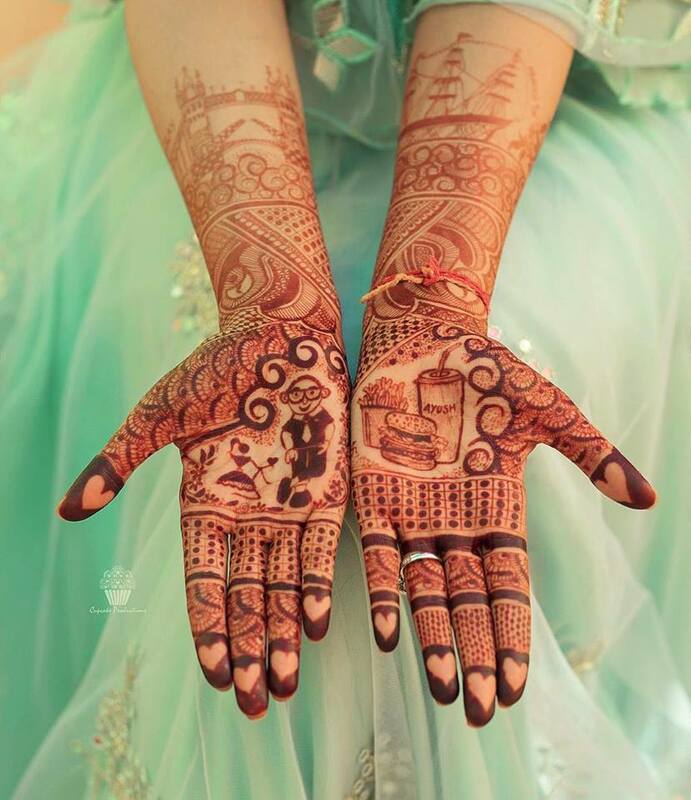 Every friend and family is sure to fall in love with how your mehendi tells a beautiful story! What’s your proposal story? Did he propose you or you were the first to make the first move? 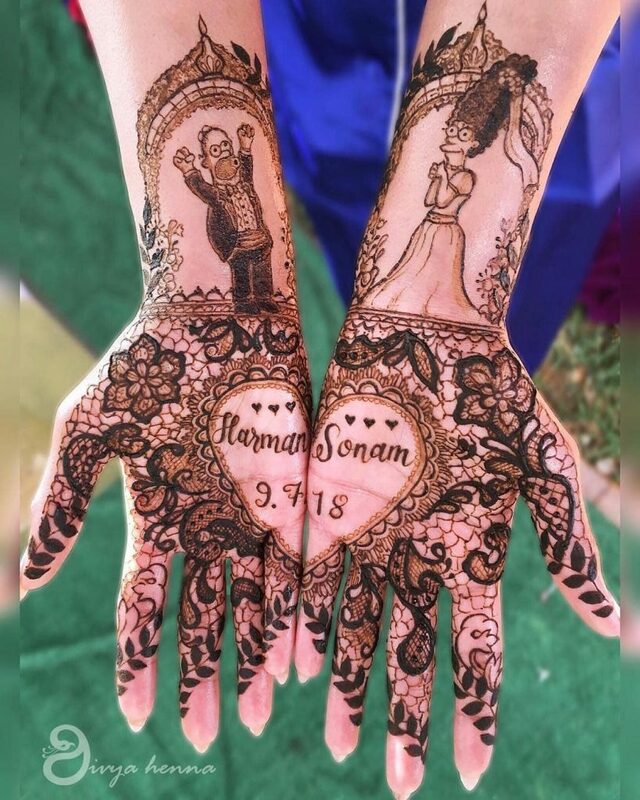 Won’t it be sooooo romantic to depict your proposal scene on your beautiful bridal hands! 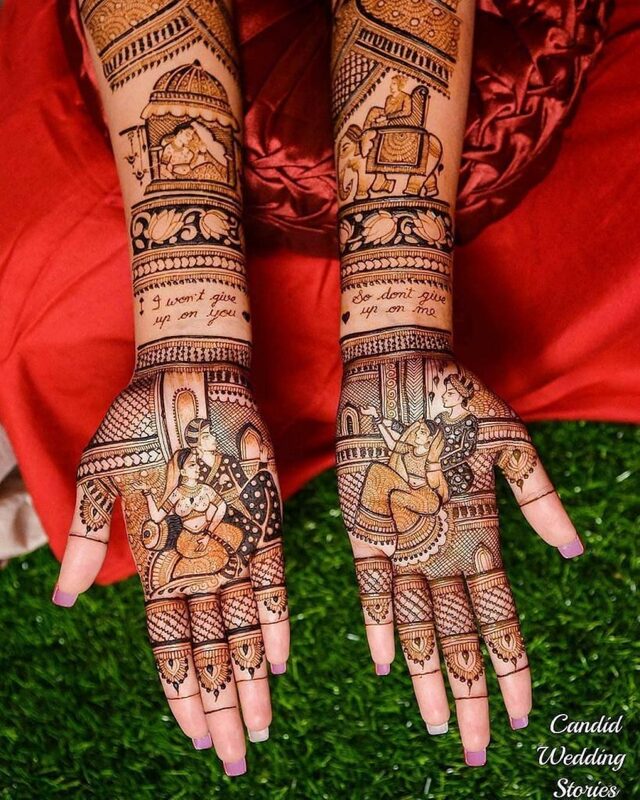 There’s something about symmetry in art that’s always pleasing to the eyes and mehendi is no different! 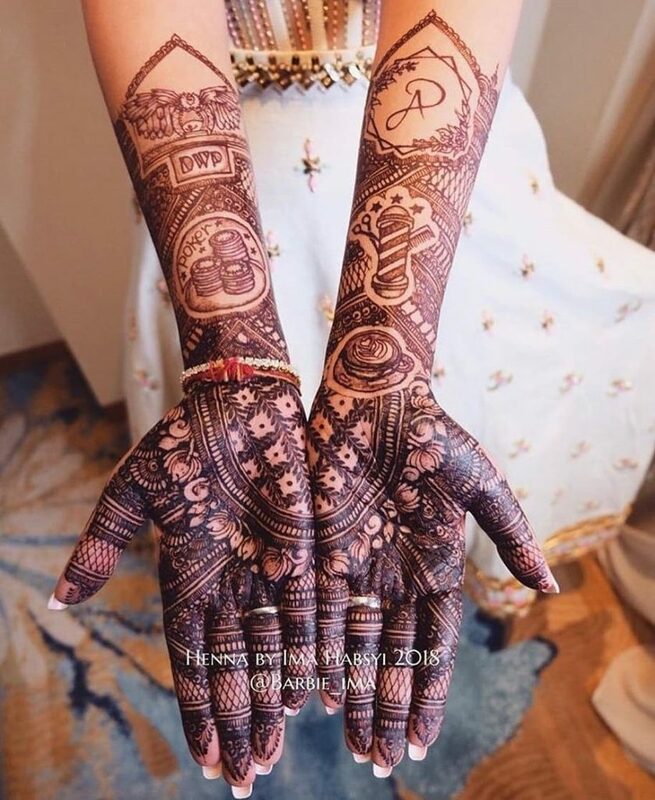 These symmetrical bridal mehendi designs look picture perfect, and give you tons of options to get beautiful mehendi shots done. 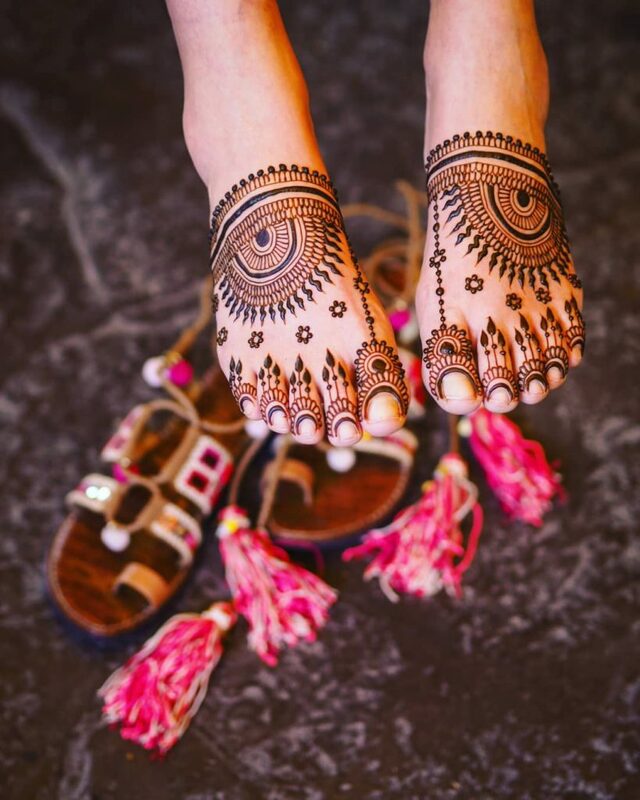 From hands to feet – you can go symmetrical everywhere and watch the magic in your wedding pictures. 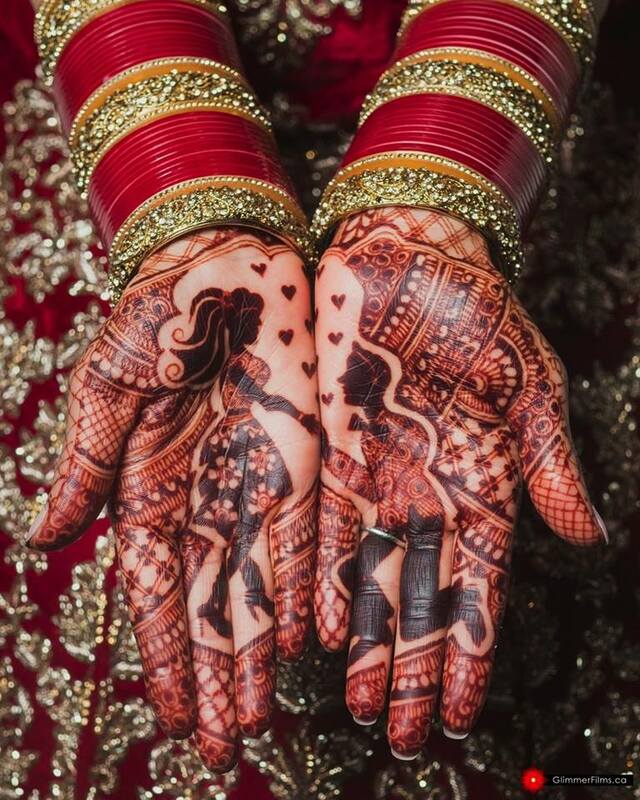 For some brides, ‘Less is More’! 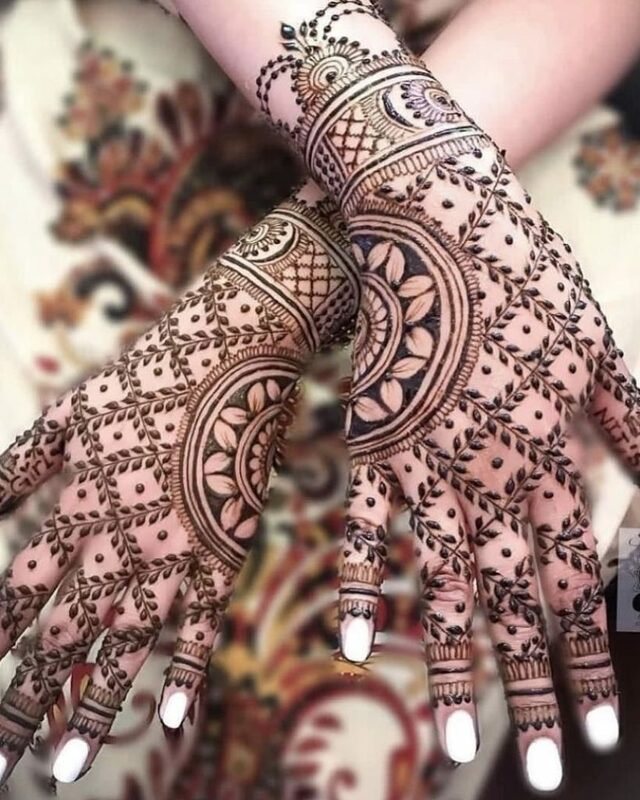 If you’re one of them, these minimalist mehendi designs are worth a try! Simple yet stylish , they make a statement without going overboard. 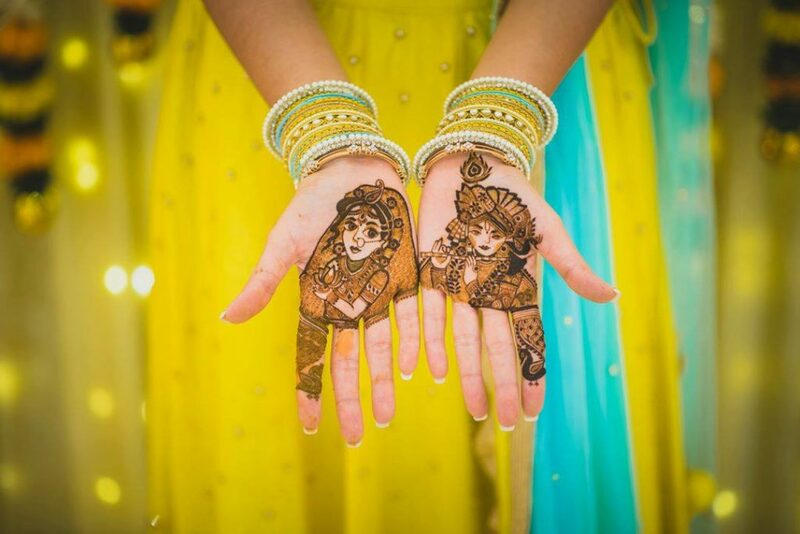 Which wedding festivities start without remembering our favourite Gods in heavens up above! 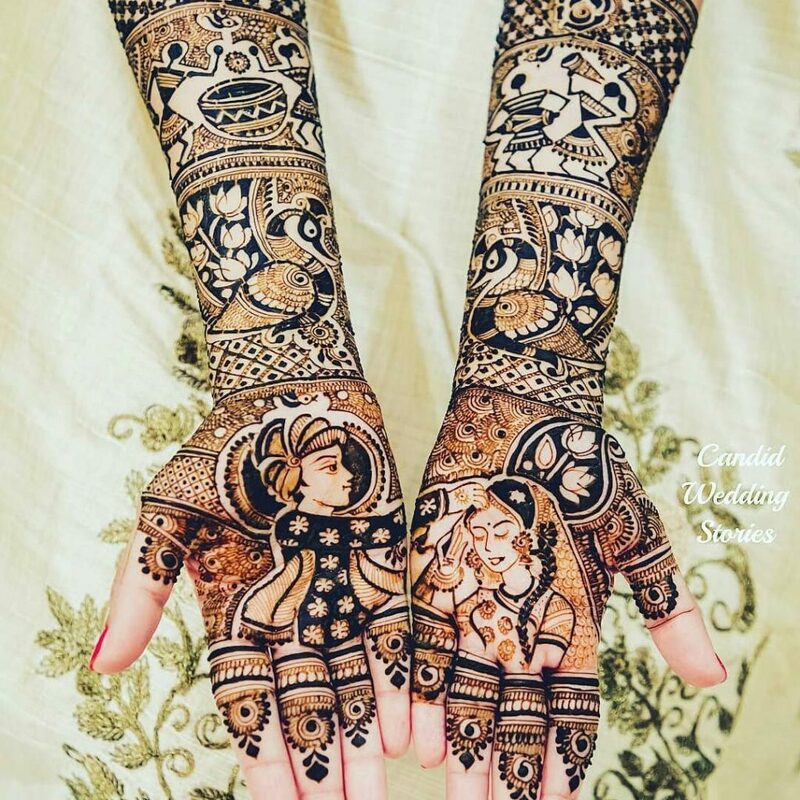 If you believe in leaving it all in God’s hands too, getting their divine presence etched in your bridal mehendi can be perfect and calming idea. 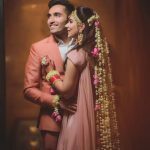 So you had long distance love story or Bollywood drama in real life? 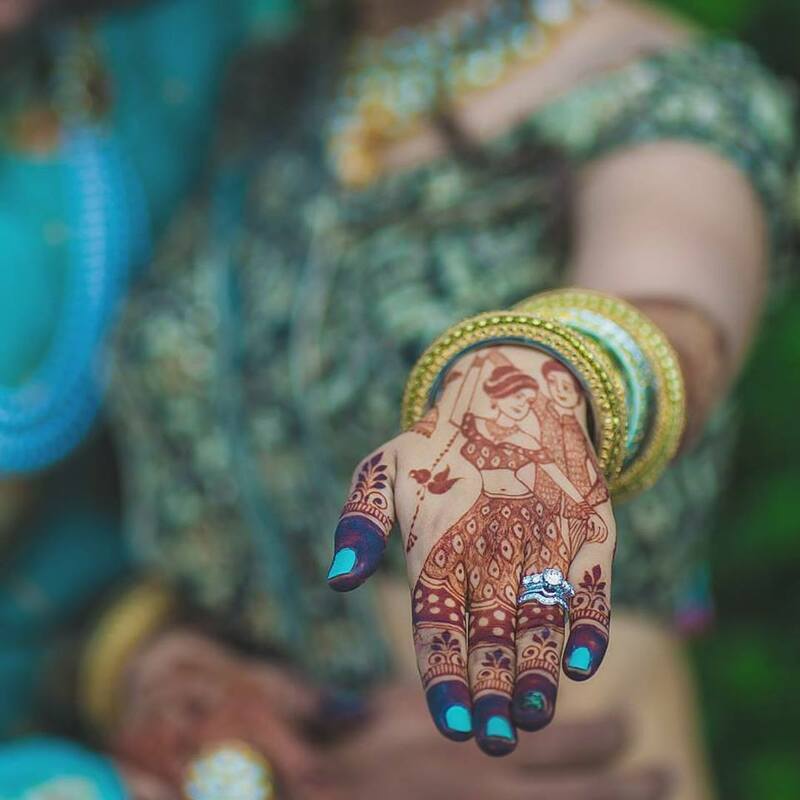 There can be nothing more creative than getting the most precious elements of your love story etched in your bridal mehendi! 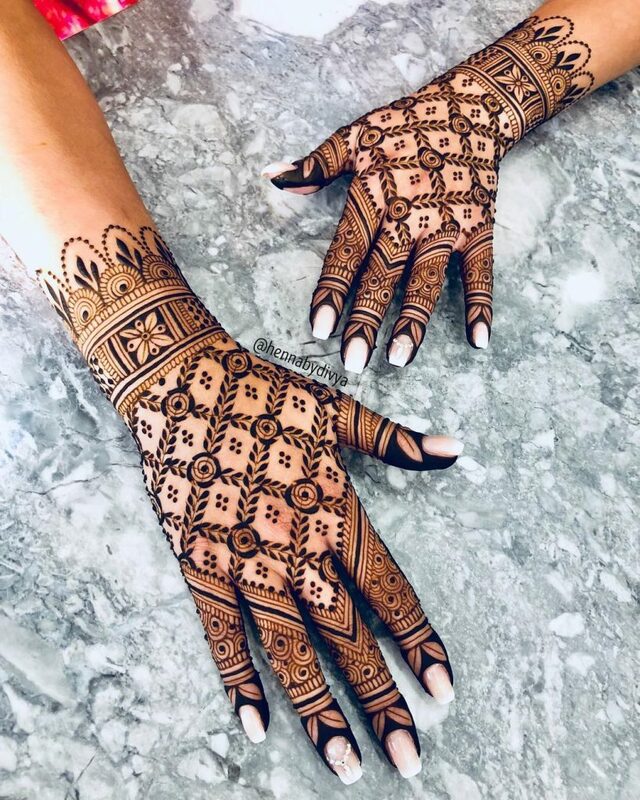 From city skylines to favourite foods and hobbies – discuss and design what’s on your mind with your mehndi artist before he/she gets down to creating magic on your palms! 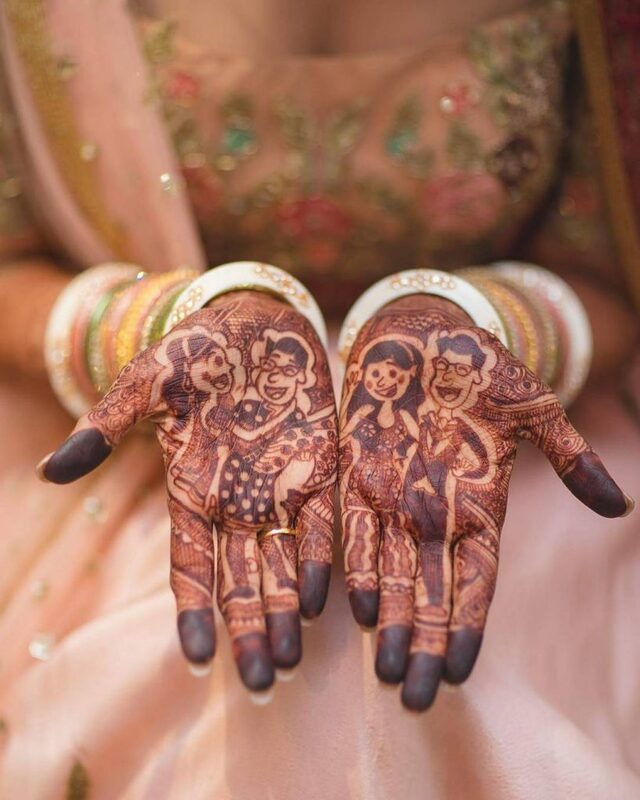 Another bridal mehendi trend we love is the caricature mehendi – your own comic versions drawn into your pretty hands. 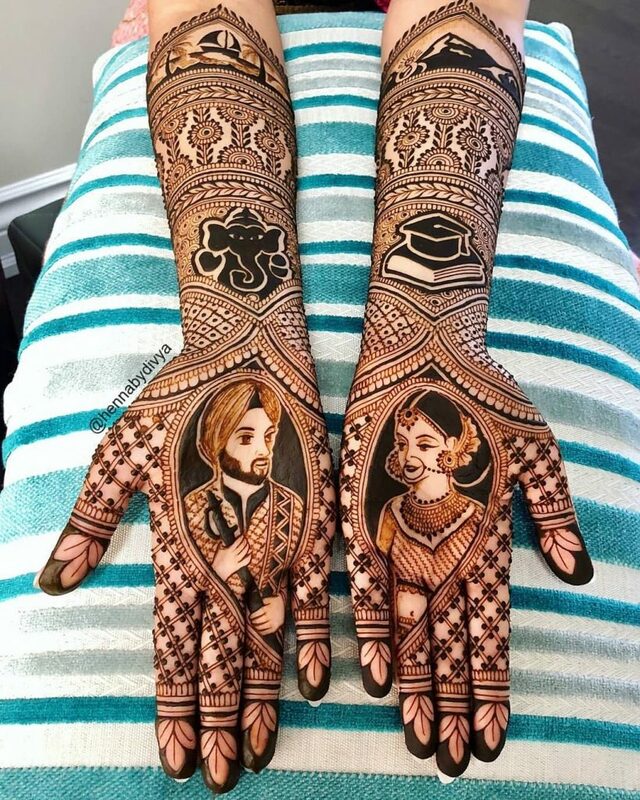 Ask your bridal mehendi artist if they’re good at creating life-like caricatures beforehand, or you might get go for cuter cartoon versions too! And of course we’re crushing over this bride getting them done on their favourite cartoon characters! 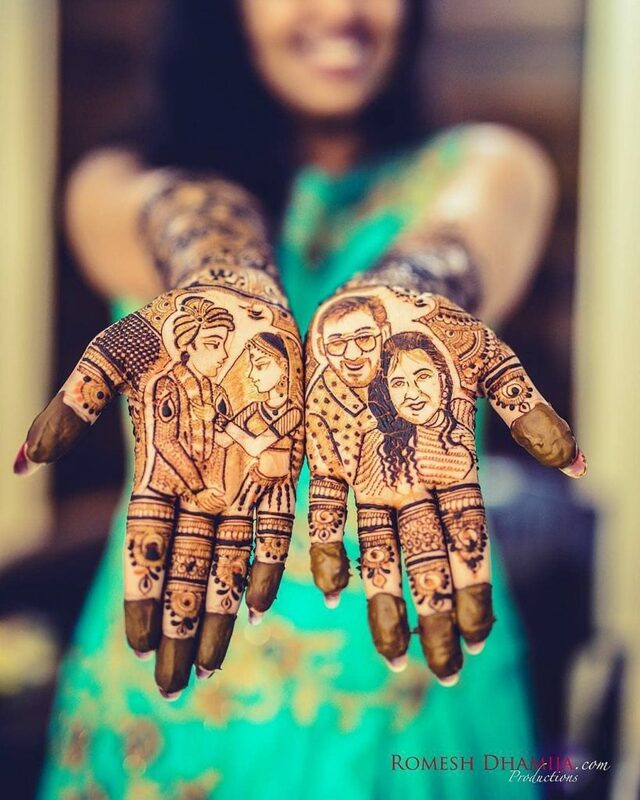 And our pretty bride Sabah loved got her own and groom Khushdeep’s caricature versions made on her hands! What’s your wedding Hashtag dear? Just like you can’t do without your dose of snapchat, your wedding can’t do without its scattering of your # here there and everywhere! 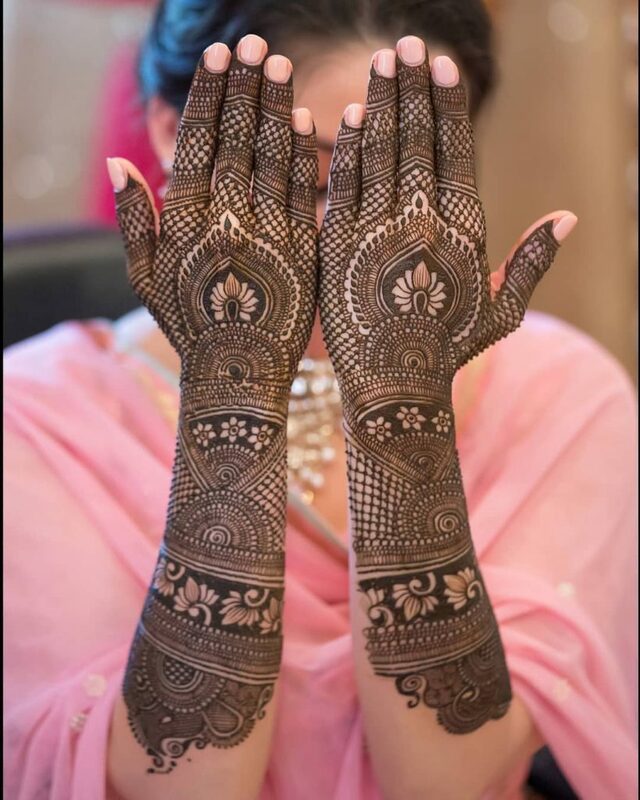 So why leave it out of your mehendi – its the 1 stop trendy, quirky element that every bride of today wants on her hands! 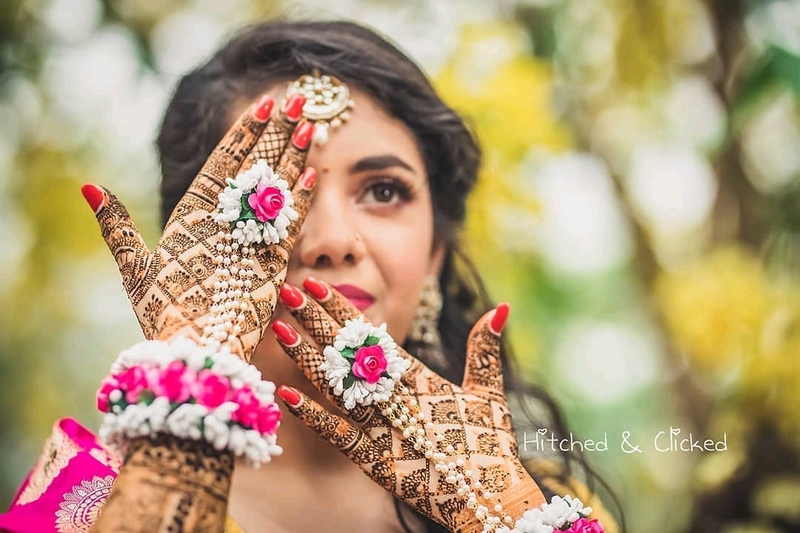 While chakri designs have been around since ages, they simply never go out of style and always look pretty in your mehendi. Circles of Memories and Life! 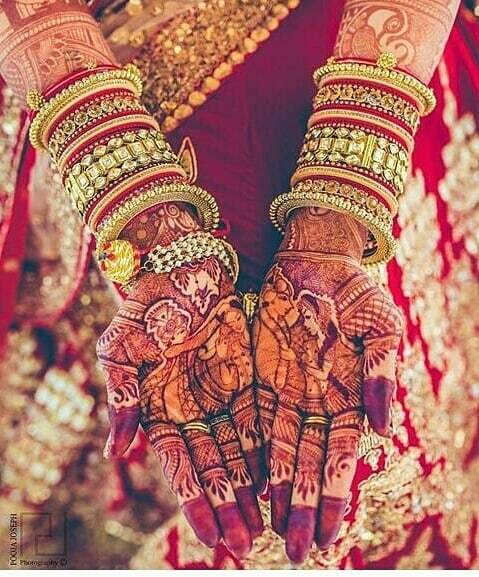 Isn’t it beautiful how the contrast of the chakri and empty spaces uplifts her entire mehndi game! 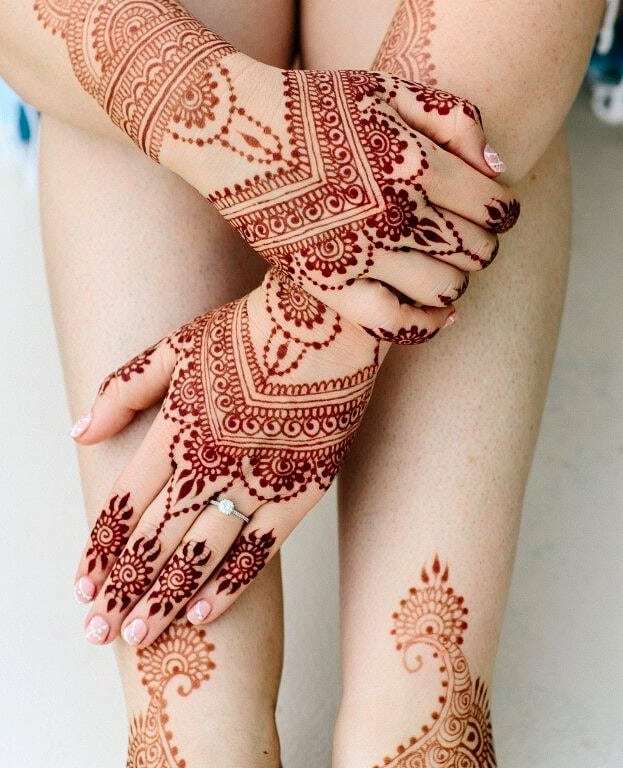 If you’re a rockstar inside, willing to go over the wild side, think a li’l far and invest in some tattoo style leg mehendi to flaunt on your honeymoon! 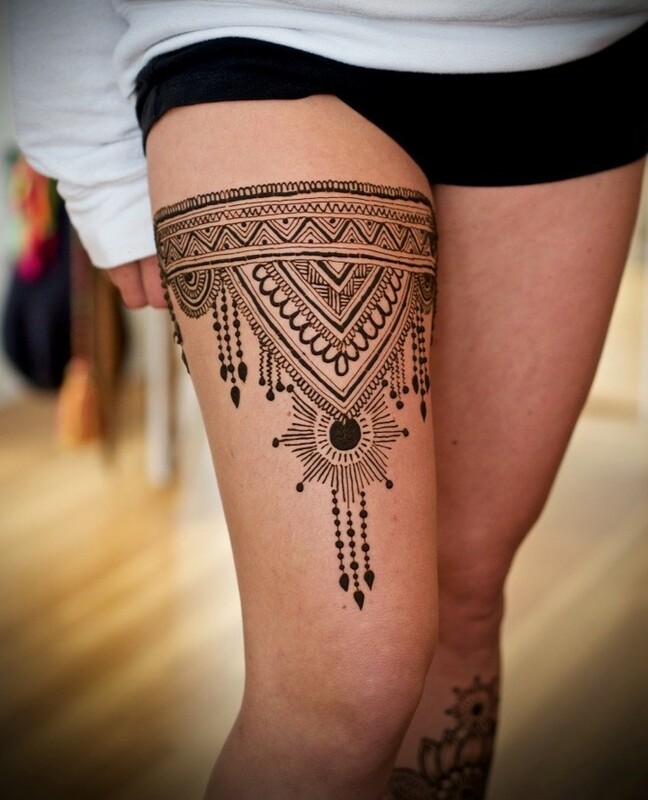 Don’t you think these jaw dropping thigh mehndi ideas are worth a million dollars! These gorgeous chequered or jaali mehendi designs are as evergreen and beautiful as the quaint Indian kairi or paisley! 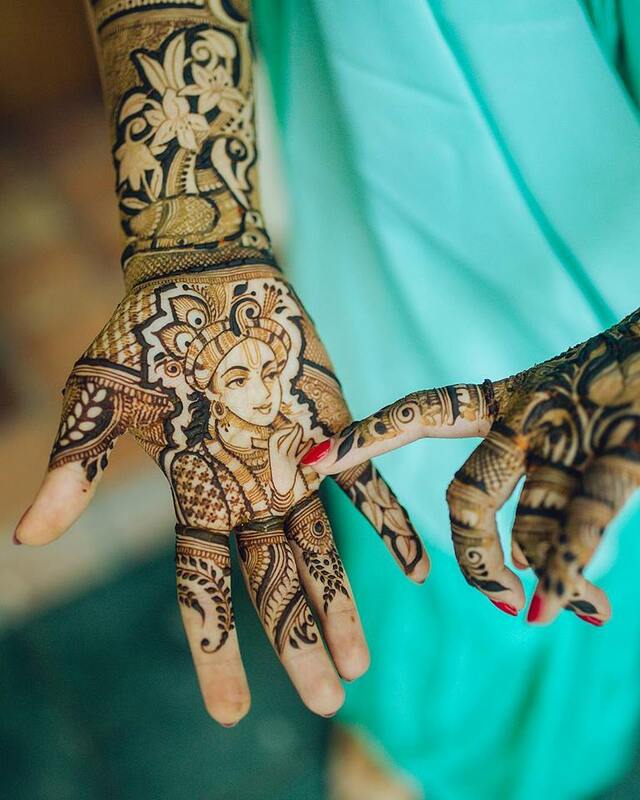 Intertwined in the Strokes of Henna! 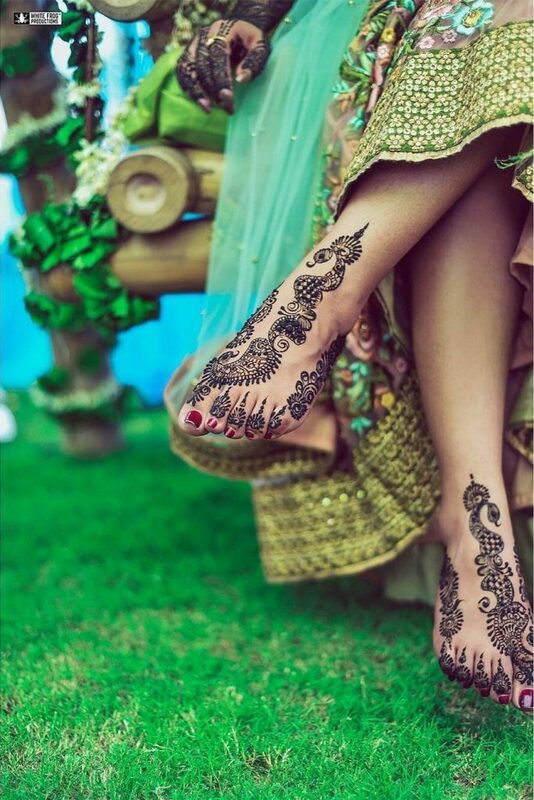 From hands to feet, simple to intricate – you can get your doze of jaali mehendi almost anywhere and in any style! 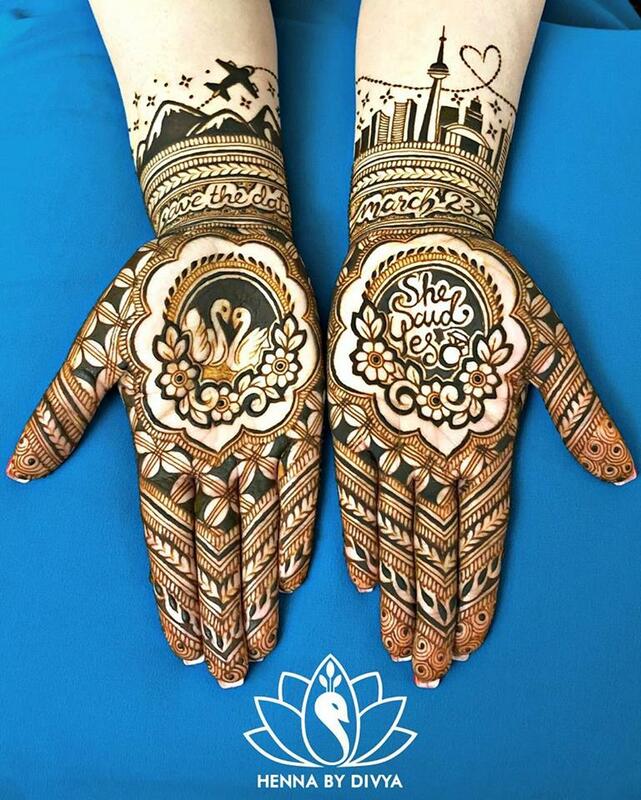 Don’t we all louuuve these lotuses made using the inverted mehndi technique! 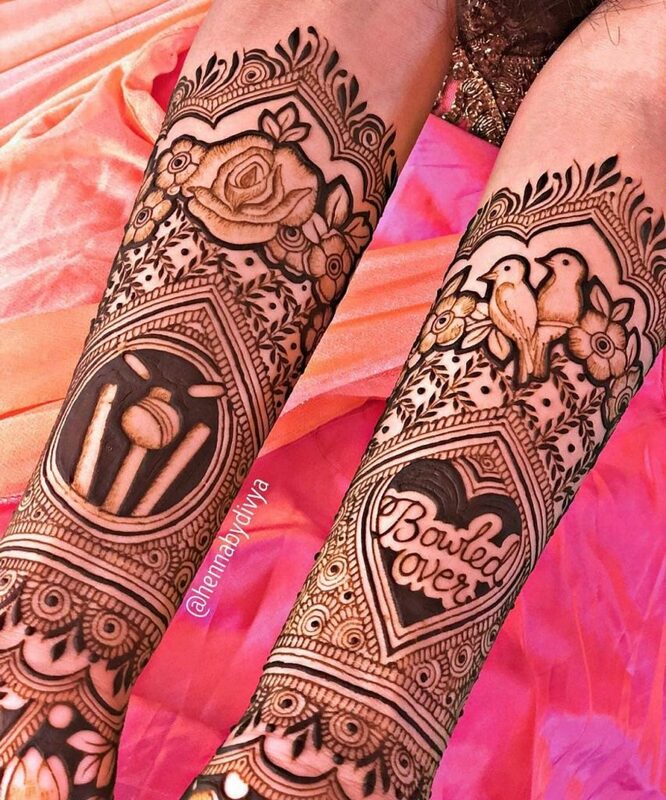 These trending bridal mehendi designs are all you need to bookmark for your d day. So what are you waiting for? Pin it & share it! 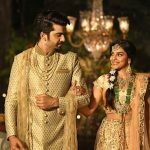 Bridal Jewellery DECODED with Manubhai Jewellers – How to Plan & What to Buy! 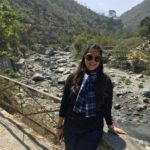 Sweety Daga is a designer & an avid follower of fashion and loves to share her views on trends in wedding fashion, trousseau, bridalwear and more! 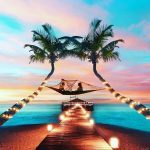 From wedding decor to design themes - she's got a take on everything that matters to you in light, informative reads that you'll love sharing!